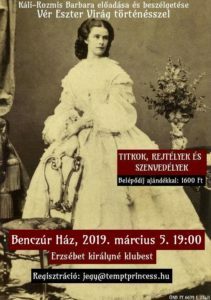 Kezdőlap » Empress Elisabeth – Sisi » Interesting Things about the Imperial Family » Eugenie & Elisabeth. The Empresses United in Beauty and Tragedy. First and foremost, it should be mentioned that both Elisabeth and Eugenie shared a relatively carefree childhood. They also deeply cherished their fathers, with whom they adored spending time outdoors, riding on horseback (at which they were both excellent) and mingling with the local community. However, Eugenie’s father, Count de Montijo, died when she was a teenager, which was a terrible blow for her. Moreover, they both wanted to pursue a career entirely distinct to being an empress. Elisabeth wanted to become a circus jockey, whereas Eugenie was dying to become an actress. As the latter one declared later in life: ‘But I was not lucky, as I became an empress’. Like Sisi, Eugenie was the younger daughter and was not supposed to get married to a highly-placed prince charming. Instead, their older sisters were supposed to do so, and, unlike their younger sisters, they were also considered to be great beauties. Nevertheless, it was Elisabeth who mesmerised Franz Joseph so intensely, that he decided to marry her instead of Helene. Still, we should bear in mind that the emperor was not Sisi’s first sweetheart, as she fell unhappily in love with a mysterious prince, who died soon before Sisi’s engagement to Franz Joseph. A similar coincidence can be found in the case of Eugenie. Her older sister, Paca de Montijo, under the influence of their overly ambitious mother, married Eugenie’s first sweetheart, which left her absolutely devastated. Some years later, she fell in love with Pepe Alcañices, and her heart was broken again because of her sister. It was Paca who warned her sister that the real purpose of Pepe’s tender love letters was to seduce Paca, not Eugenie. It is hard to say whether Nene, deprived of the title of the future empress, felt heartbroken or not. In fact, she is said to have experienced a happier marriage than Elisabeth herself. However, the imperial siblings cherished deep sisterly love until the rest of their lives. Neither Elisabeth nor Eugenie was slated for a prominent role at all. Eugenie was ‘merely’ a Spanish countess, whereas Elisabeth was a Bavarian duchess (even though her aunt was the emperor’s mother and Nene was considered ‘good enough’ to become Franz Joseph’s spouse). And yet, they both became consort empresses. Louis-Napoléon, the descendant of the legendary Napoleon Bonaparte (who was the idol of both Eugenie and her father), was appointed the president of the French Republic in 1846. At that time he met Eugenie. Clearly smitten with the pretty 23-year-old Spanish girl, Bonaparte was trying to seduce her ever since. But Eugenie was clever enough not to be seducible. She did not want to become another mistress of Napoleon, who was notorious for being an incurable womanizer. Their flirting lasted for several years. It was only after Napoleon’s coronation, when he finally decided to propose to Eugenie. The emperor was quite generous – he presented his fiancée with jewellery galore and… bouquets of violets, Eugenie’s (and Elisabeth’s!) favourite flowers. He once put a crown of violets on her head, whispering to her ear: ‘I am giving you this crown, before another one comes…’. It is hard to state whether Eugenie was actually in love when marrying Napoleon III. The same may apply to Elisabeth. After all, as her mother put it, ‘one does not turn down an emperor’. Nevertheless, Eugenie then admitted that she could not love ‘a man who would not think as gallantly as him’. However splendid the imperial weddings were, the marriages turned out to be a disaster. Napoleon III admitted that he managed to be faithful to his wife only for six months. Franz Joseph also betrayed Elisabeth, which was a devastating experience for her, especially taken into account her young age (Sisi was only 16 when marrying Franz Joseph, whereas Eugenie was 27). Both ladies were also extremely unsatisfied with their sexual life, probably due to indelicacy of their far more experienced partners. On top of that, Elisabeth lost her little daughter when she was only two. Eugenie, on the other hand, suffered two miscarriages before she gave birth to the long-awaited crown prince. No wonder he was the apple of his mother’s eye. 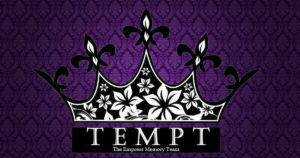 Mirror, mirror on the wall, who’s the fairest empress of them all? Being eleven years Elisabeth’s senior, Eugenie was the first empress in history to have been declared the most beautiful woman in Europe. Contrary to her own mother’s beliefs, who thought she was considerably uglier than her older sister, Eugenie was described as astonishingly beautiful. Slender, blue-violet eyed and gifted with an unique colour of her dense hair, described as something intermediate between chestnut and blond, she made a huge impression on men. If we add the fact that she basically created her own fashion style and became the very first fashion icon of the modern world, we should not wonder why she was considered Europe’s greatest beauty. Due to her striving, Paris became the capital of fashion. Furthermore, she appointed Charles Worth to be her official dress maker, Pierre Guerlain to be her perfume maker, and Franz Xaver Winterhalter to paint as many portraits of hers as possible. However, soon she had another rival to the title – the slender Empress of Austria with the wonderful crown of plaited dark hair. Seeing how successful Eugenie was in her striving for perfection, Elisabeth chose to follow in the French empress’s footsteps. She too commissioned Worth and Winterhalter, perhaps even to a greater effect. Both empresses owed those men their eternal fame. As they both wore Worth’s dresses for the memorable events that immortalised them – Elisabeth for the Hungarian coronation in 1867, and Eugenie two years later for the Opening of the Suez Canal, they made history. And whenever we think about them, we see their portraits by Winterhalter. “Elisabeth and Eugenie (bowing to the political circumstances) gave no signs of friendship, let alone intimacy, in public. Nevertheless, they understood each other far better than gossip of their alleged rivalry would have. Count Wilczek reported that one afternoon in Salzburg Elisabeth paid a call, inconspicuously and entirely privately, on Empress Eugenie, and he, Wilczek, had been made to stand guard outside the door to keep away all other visitors. When Napoleon III himself asked for admittance (…) he became uncertain and went to ask Eugenie whether her strict orders to admit no one really applied to her imperial consort as well. (…) [Wilczek then came into the room and said:] »Across from it there was a large mirror, and with their backs turned to the door behind which I stood, the two empresses were busy with two tape measures, measuring surely the most handsome calves to be found in all of Europe at the time. The sight was indescribable, and I shall not forget it as long as I live«”. 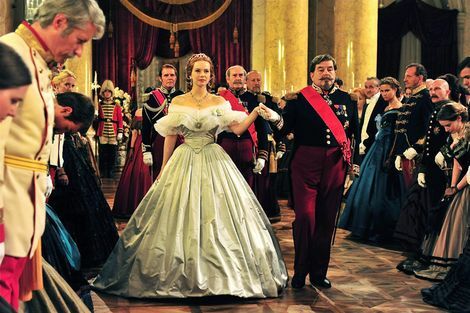 Contrary to Franz Joseph, Napoleon III let his wife into the tricks of the trade – and involved her into political matters. It is believed that Eugenia contributed to the fall of the Second Empire due to her political activity, e.g. due to the French intervention in Mexico. Tragically, it was Eugenie who supposedly persuaded her husband to coerce Maximilian of Habsburg, Franz Joseph’s younger brother, into taking over the throne of Mexico. Envious of his older brother’s title and pushed by his ambitious wife, Charlotte of Belgium, Maximilian subsided and became the emperor. He reigned for merely three years. Abandoned by his former allies, Napoleon III being the first of them, he was executed by a firing squad in 1867. Charlotte never recovered from this tragedy and went mad. It is also worth mentioning that Franz Joseph could justifiably feel doubly betrayed by Napoleon III – because of his brother and the result of the war between Italy and Austria. After the disastrous defeat in the battle of Solferino (1859), Franz Joseph lost his Italian provinces. Both tragic events are depicted in the series “Sisi” (2009), starring Cristiana Capotondi as Elisabeth and Andrea Osvárt as Eugenie. 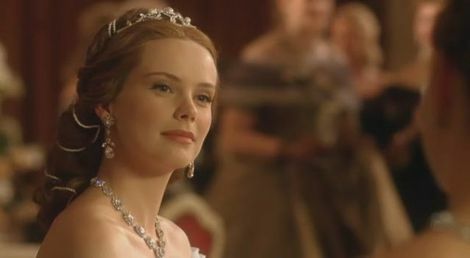 “Sisi” (2009), starring Cristiana Capotondi as Elisabeth and Andrea Osvárt as Eugenie. Devastated after Rudolph’s death, Elisabeth mourned him for the rest of her life. She tried to ease the pain by long-distance journeys. However, she was not alone with her suffering. Eugenie was going through the same tragedy – her only son was killed in action as a British soldier fighting the Zulus in Africa. Moreover, Eugenie mourned her husband, whom she had forgiven his notorious acts of adultery, and was now the ex-empress of the non-existing empire that collapsed in as early as in 1870. Like Elisabeth, despite being a devout catholic, Eugenie embraced the spiritualistic philosophy, believing that she may get in touch with her deceased family members. She also chose to travel around the Mediterranean Sea. In winter 1896, both empresses unexpectedly met in Cap Martin. At first, Eugenie was rather reluctant to accompany the mysterious Elisabeth, yet they soon relished in each other's company. And so, two empresses, once hailed as the most beautiful women in Europe, and now mothers in mourning, were seen walking together around the Cap Martini forests. It was their last meeting. Two years later Elisabeth was assassinated in Geneva. In 1906 Eugenie was invited to Bad Ischl by Emperor Franz Joseph, whom she always considered the most respectable monarch of her times. "Like me, the Emperor has lost his wife and son in tragic circumstances. But he was still in power, whereas I was the poor, crownless empress (…) It is said that God gave me all the things one can only wish for only to take them away from me, one by one, and leave only memories" – she later recalled in her memoirs. Unlike Elisabeth, Eugenie was one of Queen Victoria’s best friends. It was England, which offered an asylum for the ex-imperial family after 1870. And this is the country where the family was buried (St. Michael's Abbey in Farnborough). Eugenie’s last journey included her motherland, Spain, where she died. She had to wait forty years until she finally reunited with her beloved son and husband. Eugenie died in 1920 at the age of 94. She lived long enough to witness the collapse of other European monarchies after World War I, such as those of Germany, Russia and Austria-Hungary. By that time Queen Victoria had been long dead. Her son, king George V, was present for Eugenie’s funeral. However, the French government did not allow for a military full-honour ceremony. As Eugenia predicted, the French never forgave her for being a non-French empress of their country. She liked to compare herself with Marie Antoinette, labelled by the French as “the Austrian woman”, whereas she herself was stigmatised as “the Spanish woman”. Like Elisabeth, she was always regarded a stranger at the court. “Not many tears were shed” after Sisi’s death in Vienna, as Mark Twain once put it. Even this bitter sentence united both unhappy empresses. Original version in Polish: Eugenia i Elżbieta. Cesarzowe, które połączyły tragedie i uroda.